For a Glorious Paschal Season! 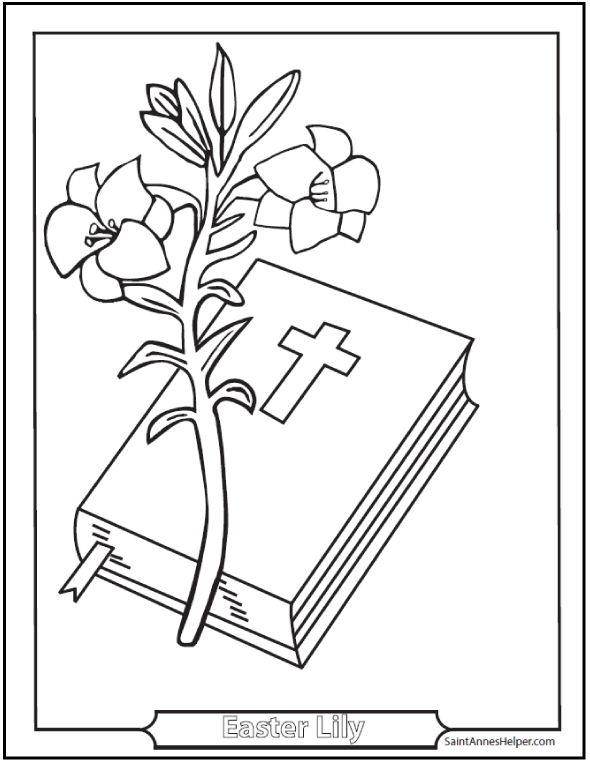 Printable Easter coloring pages for catechism class. Happy Easter! 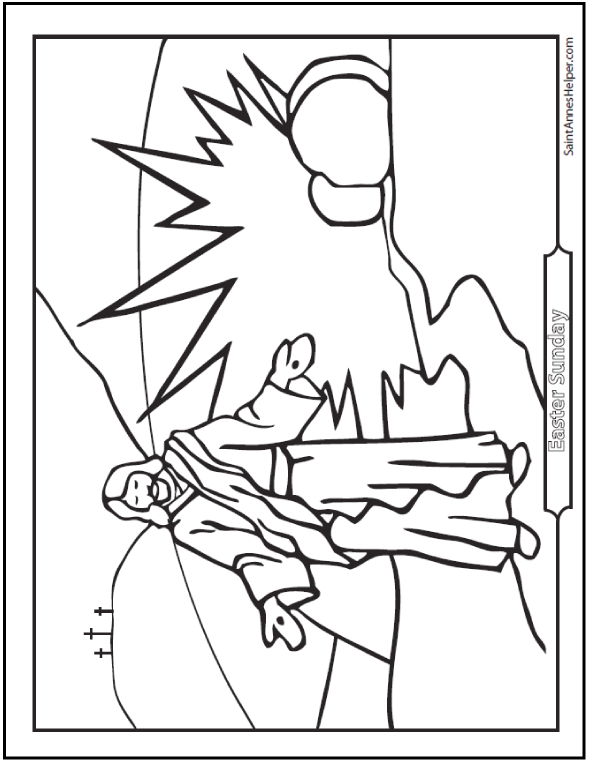 Our free printable Easter Coloring pages are great activities for keeping little ones busy as Easter dinner cooks or for making a treasure to give family and friends. 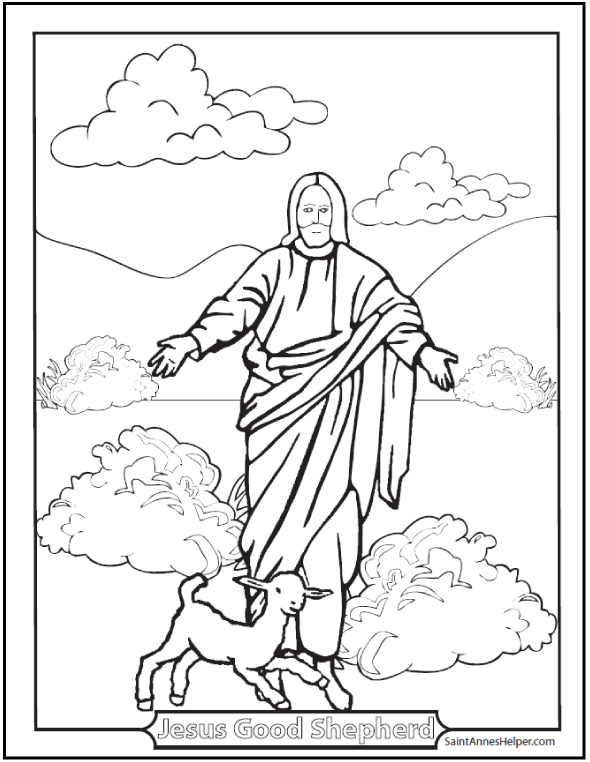 The first picture can be used for Ascension Thursday, as it is also in the Easter season. See more Easter ideas below these pictures. St. Patrick, St. Joseph, St. Benedict. 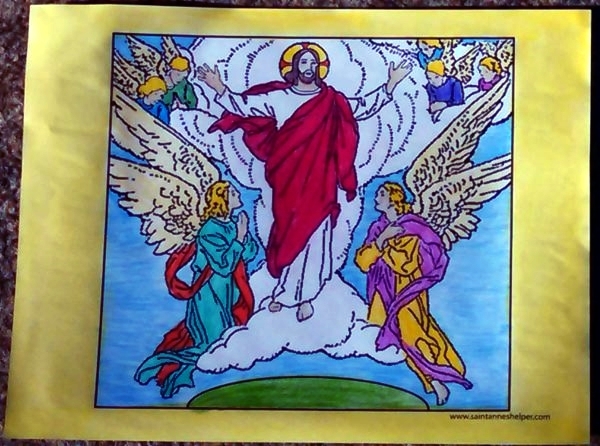 Ascension, Pentecost and other Rosary coloring pictures. Children like learning that Easter Sunday is the feast of the Resurrection of Jesus Christ, the most important feast of the year. It's the goal of Lent. The Catholic Church has always taught this. Why? 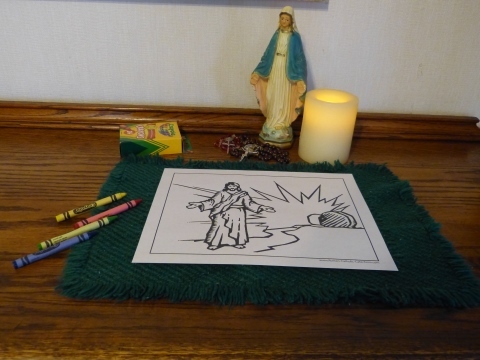 Because He rose by His own omnipotent power. 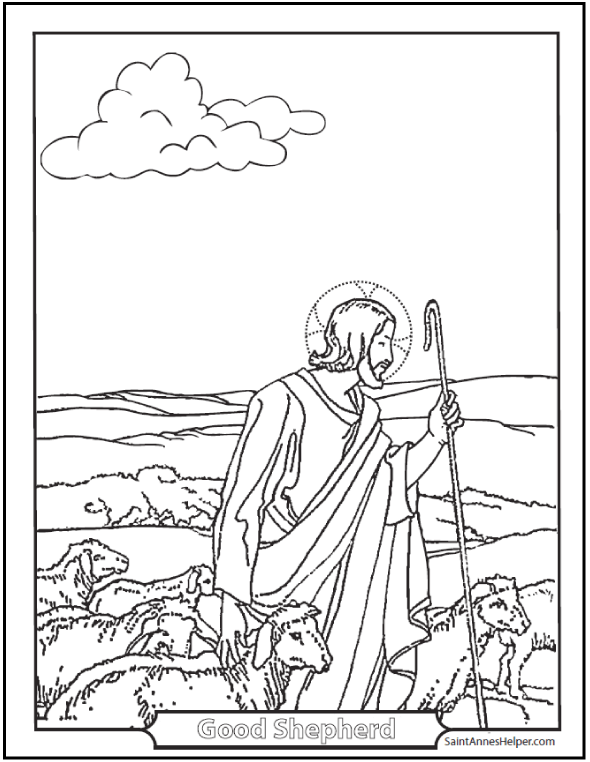 This marks the day that He proved that He truly is the Son of God and is the answer to God's promise to Adam in the Old Testament Bible story. The Resurrection of Jesus is also the First Glorious Mystery of the Rosary, so we try to remember to pray for an increase in the supernatural virtue of Faith when we pray the First Mystery. "O Lord, increase my faith." I'd have a hard time remembering to pray for specific virtues without this habit. 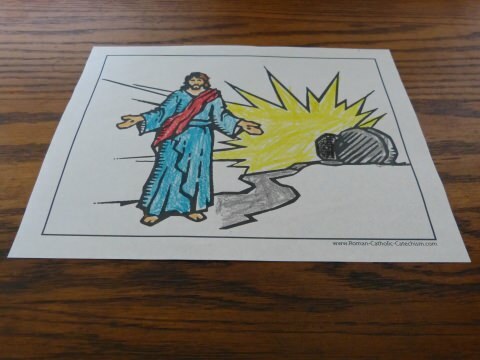 Many catechisms omit this or distort it making it seem as if He was raised by God the Father alone. It is true that when One acts All Three act, yet it is also important to teach that He rose by His own power, this same divine power so as not to imply that Jesus was not active in the Resurrection as taught in the Catechism of the Council of Trent. 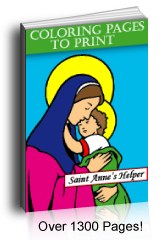 It may seem like splitting hairs when it comes to teaching little ones in First Communion, but I think that it is super important because St. Paul called it the pivotal point of our Faith. Also, what children first learn, they keep longest. Care and study on your part in the beginning is super important for the future. The Resurrection is the pivotal point of our Faith because it proves Jesus' divinity. St. Paul said that our Faith is in vain if the Resurrection is not true. 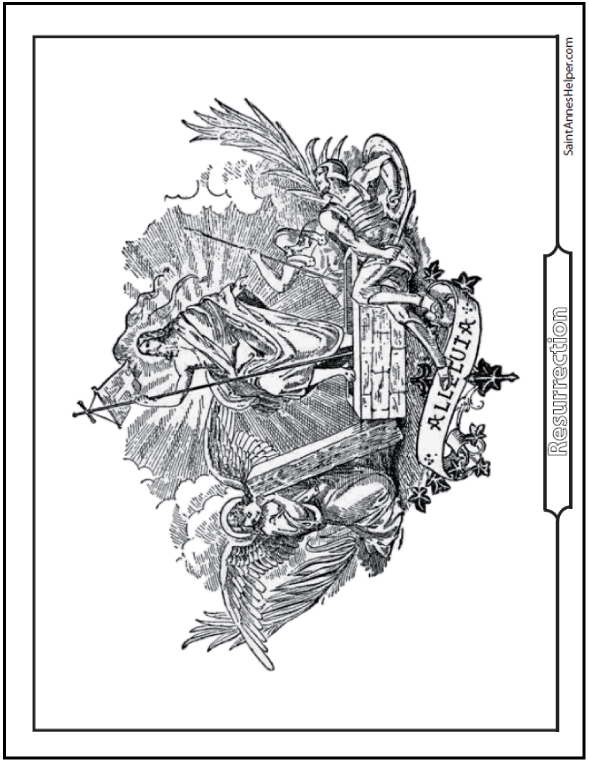 I would beware the New Saint Joseph Catechism series on this point, as I think that all three books in several versions that I own do not teach the Resurrection or the Ascension plainly. "The Resurrection of Jesus Christ, by His own power from the dead is the crowning miracle of His career. Indeed it is more than a miracle; it is the fulfillment of a prophecy." "Notice that Christ taught, and was understood by the Jews as teaching, that He would rise from the dead by His own power. The prophecies do use such active expressions as, "till the Son of man be risen (not raised)"; "I will raise it up"; the third day He shall rise (not be raised) again"; "after three days I will rise again." When is Easter? It's the day after Lent is over, Holy Saturday. Easter Sunday is the end of the liturgical season of Lent and is the most important feast of the year. It is good to know early so as to be able to prepare the children well spiritually. The Easter date changes every year because it depends on the cycle of the moon. "The date of Ash Wednesday varies every year between February 4 and March 10." 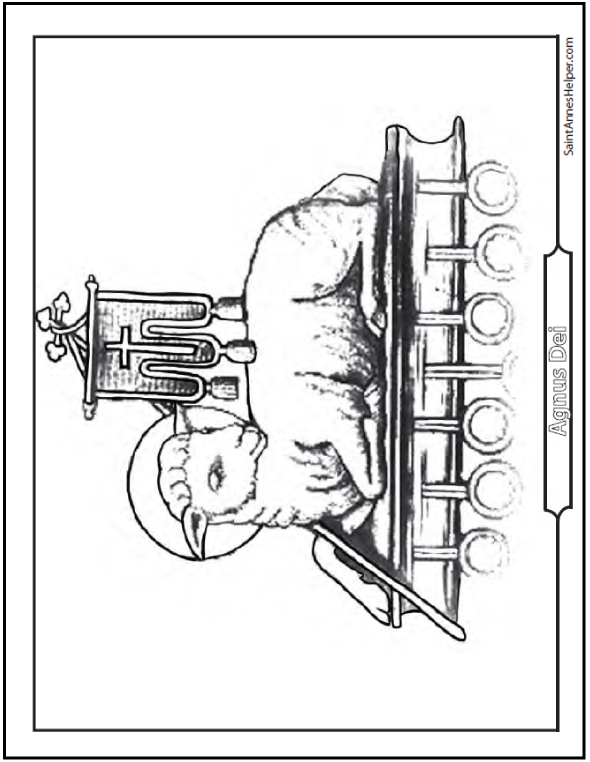 (Practical Meditations, p. 80) which means that, because of the way that the days of the week fall, Easter can be as early as March 21 and as late as April 25 . 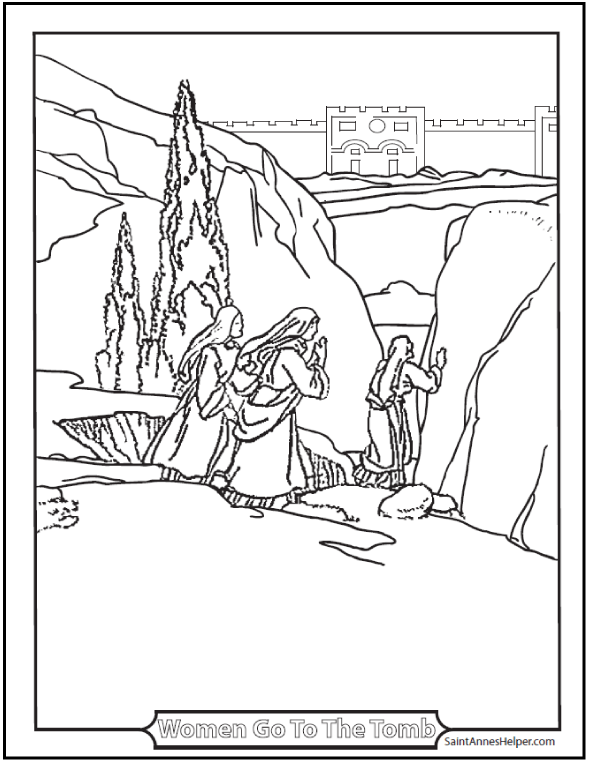 Easter falls on the Sunday following the full moon for spring. After July 1 the dates for the Liturgical year are more regular with few variable dates outside the beginning of Advent. 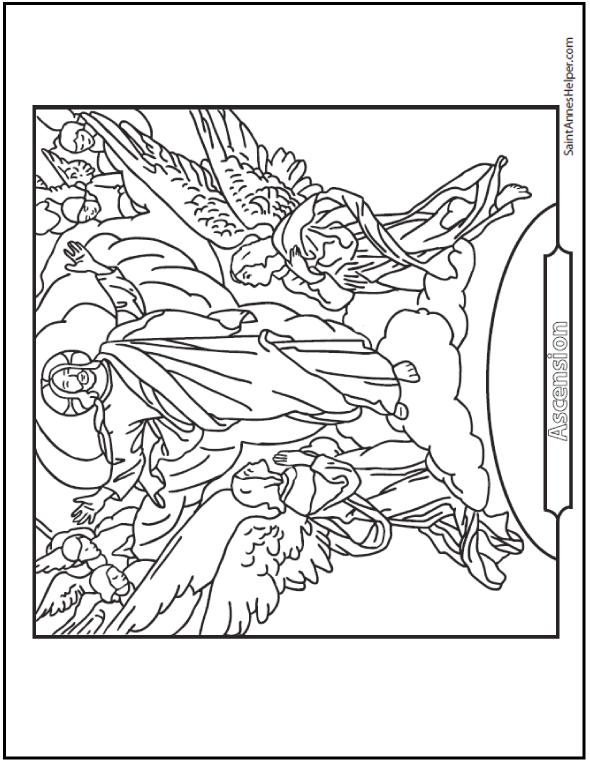 I try to add the date of Easter to our home page every year, and some years we've been able add new printable Easter coloring pages. Easter dresses should be modest and, because Easter is the most important day of the liturgical year, we should wear our best clothes for church. Children love this. The trick is to teach them to dress their best for the love of Jesus, not for vain reasons. We dress to honor the person we visit. In this case the Person is the adorable Son of God Himself. Once Lent is over we put away the dark clothes of winter for the lighter colors of spring. This is another thing that can take time to prepare, especially when you have lots of children. I can remember collecting our light colored clothes, socks, and shoes to get them ironed and sorted in plenty of time. The light and pastel colors make a nice Easter coloring palette. We've seldom bought new "for Easter", yet sometimes we do have a new-ish dress or suit from Confirmation or a previous wedding. I learned many good ideas reading Dressing With Dignity, which is a lovely book by Mrs. Colleen Hammond. It gives many good ideas for improving your selection of clothes and why. She had been a television weather reporter and is a beautiful lady with an excellent story full of good ideas. Dressing With Dignity is a great gift for those ladies entering the work world where more outfits are necessary and need to be dressier. You can get ideas from Colleen about modest Easter dresses, too. Modest dresses can be very hard to find. Sometimes the best bet is to find a pastel colored suit or add a white or light blouse to flowered sundresses. I am the mother of five girls and we are all grateful to the companies that offer modest clothing. Here are a few. One of my favorites is the modest blouses at Phyllis Jean Modest clothing. The white blouse is cotton and very Easter-y. The simple white blouses for ladies and girls will go with most any jumper or suit. Their skirts and slips are super for taller ladies and their cotton slips have been a God-send in our hot Kansas summers! The ladies at Lilies Apparel tailor these beautiful clothes themselves. You can custom order nearly every single element of the dresses, skirts, blouses, or slips. I've been very pleased with the quality of the material and the workmanship. We even have two dresses that we special ordered for First Communion and they are lovely keepsakes. 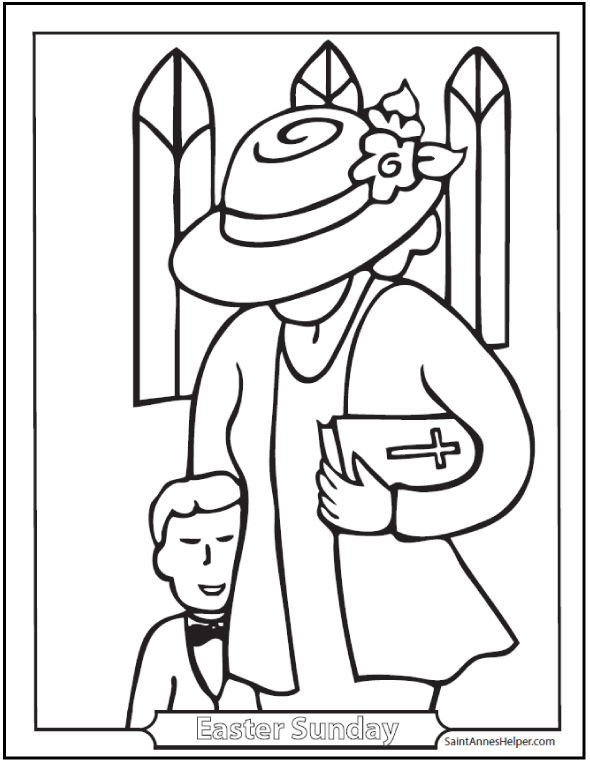 If you have a First Communion coming in the next year while you're getting ready for Easter, try to find your First Communion accessories like white shoes, fancy socks, white purses, etc. Many stores quit carrying these items soon after Easter and they are way more expensive at bridal shops. Here again it is important to focus on giving the honor to Jesus, not our own glory. Appleseeds - many darling separates, well priced, modest and dressy enough for Easter. Orvis - more expensive but enduring quality. Lands' End - great for separates and enduring quality. L L Bean - same. 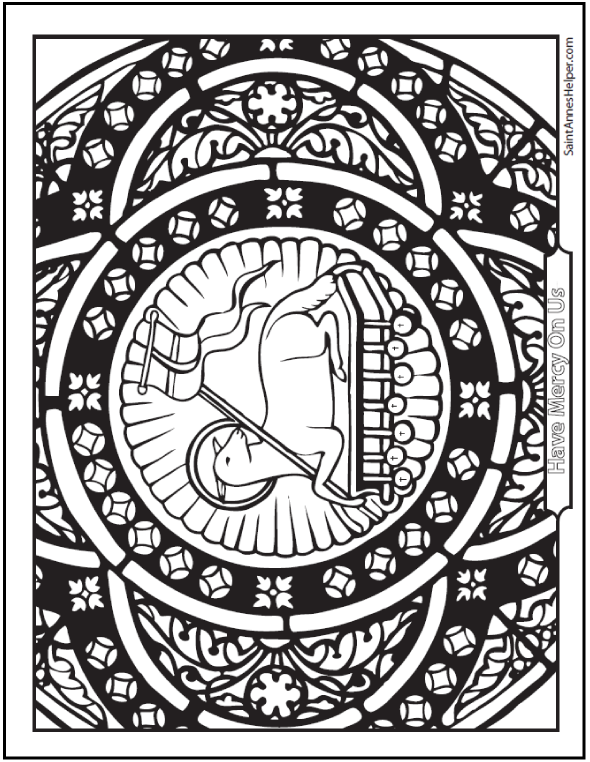 You might also be interested in our other coloring pages that are related to our printable Easter coloring pages. 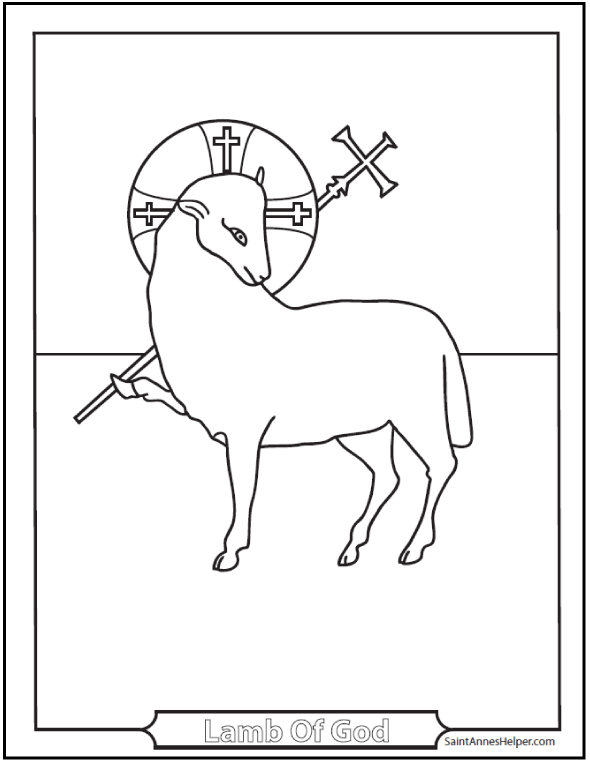 Thank you for sharing our Easter coloring pages!